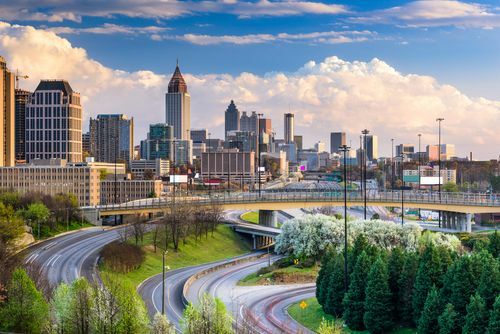 In 2019, Georgia is one of the nation’s fastest growing states. There’s a reason for that; actually, there are five good reasons. If you’re unhappy with where you live, consider moving on over to the Empire State of the South. No matter where you hail from—whether it be the US, North America, or even further afar—you’ll find lots of reasons to love life in Georgia. Georgia is an exciting place to immerse yourself in Southern culture. There’s a great variety of music flooding the streets, like rhythm and blues, rock and roll, and country music. The state has a celebrated history of folk music, like other Southern states, but there’s also a vibrant hip hop scene for those seeking modern musical entertainment. It’s also the place that Ray Charles called home. Folks in Georgia go peaches over the cuisine. Southern barbecue is the real deal, but the state is also a big producer of the three P’s: peaches, pecans, and peanuts. Be sure to have some before you leave. Georgia has a storied literary history. Prominent authors like Margaret Mitchell, Alice Walker, and Flannery O’Connor have written about the struggles, history, and horrors of the Southern landscape. If you’re a fan of architecture, you’ll love exploring Georgia’s many cities. You can find elegant antebellum mansions and even new Luxury Collection Hotels. Georgia is a highly religious state, and in every town you’ll find beautiful churches of varying architectural styles. On that note, be prepared to experience the region’s famous “Southern hospitality”; this is a very friendly and welcoming place to live. One of the most enticing things about Georgia is the low cost of living and cheap prices for hotels. Homes in Atlanta are relatively expensive, but in other cities housing costs are below the national average. With the exception of studio apartments—which are generally pricey in Georgia—most rentals go for less than the national average. Property taxes are also lower than the national average, as are hotel prices, which is why so many hotel chains are opening new buildings in the state. Of course, when you don’t have to pay so much for housing, you’re able to put more money into stuffing your toy box. Want a nicer car? You’ve got the money for it now, and we’re willing to bet there’s a VW dealer in Columbus, GA, that has the exact model you’ve been eyeing online. Not to mention, Mercedes-Benz made a mark on Atlanta, so luxury vehicles are never hard to find. No matter if you’re planning a dream vacation or want to try out the state’s delicious eateries, living in Georgia will put more money directly into your pocket. The Atlanta Falcons played in Super Bowl LI, the Atlanta Braves have won three World Series championships, and Atlanta United FC won the MLS Cup just last year. This is a good place to be a sports fan. If you prefer college sports, the Georgia Bulldogs are perennial champions in NCAA football. Alternative sports are popular here, too. The Masters Tournament of professional golf is played annually in Augusta at the Augusta National Golf Club. Plus, Dawsonville is considered by some to be the birthplace of NASCAR. Do you ever sit through the credits when a movie ends? It’s not as crazy as it used to be, especially because many movies these days place hidden scenes after the credits roll. You might have seen the “Georgia Logo” near the end of the credits (it’s a stylized peach). Since 1972, over 700 film and television products have taken placed in Georgia due to the state’s generous tax incentives. In fact, in 2016, Georgia had more feature film productions than California—the home of Hollywood! Go to Atlanta if you’re interested in working in film production. If you like to get close to movie sets to try and spot movie stars, then you’ll enjoy the plentiful amateur paparazzo work in Georgia. One of the most interesting things about Georgia is the thing that it has struggled to grapple with—its history. From the days of slavery to Martin Luther King Jr.’s civil rights movement in Atlanta, Georgia has played a key part in the formation of this country. Know that the state is quite aware of its complicated history and Confederate associations, and its many museums and historical sites provide great context that celebrates Georgia’s colonial heritage while providing insight into its less reputable histories. You can visit battle sites from the War of 1812 and the Civil War, as well as Native American cultural sites. Historic buildings and plantations abound; this is truly history buff-heaven. Come try it out! Whether you’re coming from across the Atlantic or over the Florida-Georgia line, any visit to the Peach State is sure to show you what the locals love about this little slice of the South.